The Jelly Belly factory is a fun place for the entire family to explore the creation of jelly beans, and get some free samples of America's signature candy at the same time. Originally started by the Goelitz family in 1869, Jelly Belly began as a small candy store with a horse drawn wagon delivery service. All jelly beans originate from a soft gel candy known as Turkish Delight, and in turn, Jelly Belly evolved into what it is today. The "true to life" flavors that make Jelly Belly popular, such as lemon, green apple and even buttered popcorn, began in 1976. The rest is history, as the famous jelly beans became the favorite candy of Ronald Reagan, and went on to become America's official gourmet jelly bean. Today, Jelly Belly has two different visitor centers - one in Wisconsin, and one in California. The California destination is found in Fairfield, CA, a relatively short drive from San Francisco. The Jelly Belly factory is full of fun things to do year round. They love special events, such as their Santa brunch offered on select dates in December. Always whimsical and welcoming to families with children of all ages, kids love the factory as much as adults, thanks to these special moments. Stickerpalooza in the summertime and Munchkin Masquerade around Halloween are other great events put on by the factory. But what can you find on a regular day in the factory? Still plenty! A world famous factory tour is available every day of the year except Thanksgiving, Christmas, New Year's Day and Easter Sunday. Be sure to call for their exact schedule, as they sometimes close immediately before and after these holidays as well. The tours leave every 15 minutes, and are about 40 minutes long. During the tour, your family will receive a special jelly bean factory hat, and get to explore many areas of the factory. Go during the week and you'll see actual Jelly Belly workers making jelly beans from combining ingredients to adding the polish and famous Jelly Belly logo to each and every bean. Kids will love the fun smells and colors, as well as the chance to see over 150 treats being created under one roof. Videos throughout the tour provide additional information and close-ups of the Jelly Belly making process. At the end of the tour, everyone receives a generous amount of free samples, so each guest is able to decide which Jelly Belly is their favorite. Private tours are also available for those who don't mind paying for a more in-depth experience. These visitors will go onto the actual candy making floor, and at the end of the hour-long excursion will receive a Degree in Beanology, as well as a T-shirt and discount shopping card for the factory store. Hardly anyone leaves the Jelly Belly Factory without a souvenir or two, and the store included inside of the factory is the perfect place to pick up some sweet treats for the road. 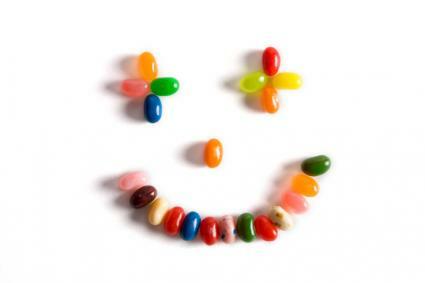 Practically every Jelly Belly flavor is available, as well as special edition beans that come and go with each season. A visitor favorite? Belly Flops, a random bag of jelly beans that have been rejected from the factory floor. The same great flavor applies, but their shapes and sizes are off-kilter from the regular jelly bean shape, which is how they landed in the store instead of on shipping trucks. Belly Flops are also fun to eat because the flavors are all thrown into one bag, leaving you the task of guessing which flavor you're currently tasting. Lastly, you'll find sugar free jelly beans, Jordan Almonds, and an entire shop section devoted to chocolate creations. Finish off the day at the Jelly Belly Café, where you can lunch on a jelly bean shaped hamburger or pizza, and also indulge in more grown up favorites such as salads and sandwiches. Find out more about the factory by visiting its official homepage, or giving them a call at 1-800-9-JELLYBEAN.